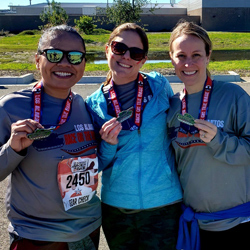 March 1, 2019 – Cypress, CA – On Saturday, February 23rd, Trident University International (Trident) took part in the 38th Annual Los Alamitos Race on the Base, held on the Los Alamitos Joint Forces Base in Los Alamitos, CA. A total of 15 staff members participated in various events that helped to raise money for local veterans’ causes. Race on the Base partners with various charities and community partners, including Honoring Our Fallen, Rock for Vets, Casa Youth Shelter, and Lestonnac Free Clinic. Involvement in this event has become a yearly tradition for Trident, and it is tied in with the University’s commitment to local, military, and veteran causes. Trident covered a portion of the registration fee for each employee participating in one of the events at Race on the Base. Trident continues to maintain an active role in its local community. For their support of the military and veteran communities, the University was recognized by the City of Cypress as the 2018 BRACE Business of the Year. In December, Trident partnered with the Los Alamitos Chamber of Commerce’s annual Adopt-a-Family program to raise $5K for families in need.